What is the value of woods? Who or what are woods for? 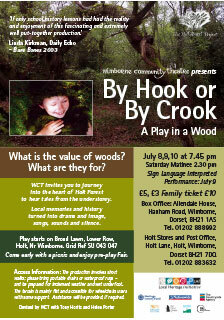 Following research and meetings with local people, almost 50 adults and children (ages 6-80 years) took part in By Hook or By Crook, in Holt Forest, devised and produced by Wimborne Community Theatre, in partnership with English Nature. The production was neither a play about history nor a documentary about ecology. It reflected what happened when a group of people entered a space (in their own lives as well as the forest) and gave time and energy to looking and thinking creatively. Local people told us their Holt Forest stories, about people being lost, and stories about local characters, like Arthur Coffin, who lived in a cottage in the forest, and his son, Walt. Others referred to the moment when national politics affected the fate of local girl, Amy Farrant, when her path crossed with that of the Duke of Monmouth in Holt parish. Different points of view about the forest surfaced: to what extent should it be managed by English Nature, how freely should horses be ridden on paths, should grazing be reintroduced, to what extent should the wood be promoted as a place for people and dogs to visit? As well as these contemporary concerns, we explored the symbolism of forests, the realm of nature’s secrets, and as places for testing and initiation or a spiritual world which we penetrate to find meaning. We hoped our interpretation would bring new visitors to the forest and indeed, over 50% of the audience had never visited the forest. The following items from By Hook or By Crook have been stored in our materials archive. Click here to view.